World’s Longest Yard Sale, America’s “most scenic shopping mall” stretches 660+ miles through 6 states! Discover deals & steals along the Lookout Mountain Parkway and Route 127’s 660+ mile stretch. Follow the purple markers for the sale route in DeKalb County. Yard sale begins at the Noccalula Falls Park in Gadsden, Alabama on top of Lookout Mountain. Follow Tabor Road, across from Noccalula Falls. Stay on this road and it will become Alabama 176. Follow 176 to the Dogtown Community and stay straight through the 4-way stop. The road then becomes DeKalb County 89. 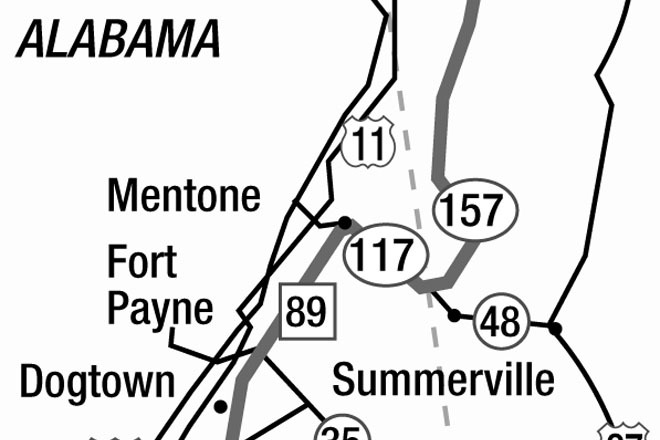 Stay on 89 through communities such as Five Points, Fort Payne, Fischer, DeSoto State Park and on into Mentone, Alabama. From Mentone turn right onto Alabama 117 and follow into Georgia where it becomes Georgia Road 48. You will stay straight a short distance before turning left on GA 157, then left on 136, right on 189 then right on 157 again. Route 157 carries you directly in front of Rock City where you travel down Lookout Mountain and pick up TN 27 to the U.S. 127 Corridor for the remainder of the yard sale where it ends in Hudson, MI. 157 becomes a winding road in Chattanooga as you make your way to the 127 Corridor. Follow Ochs Hwy. off of Lookout Mountain to Tennessee Ave. to Broad St. to Hwy 27 to the U.S. Hwy. 127. Simply reverse these directions if you choose to follow the route from North to South. Although the Yard Sale officially goes from Gadsden, AL to Addison, MI, feel free to jump on board anywhere in between. Lots of treasures and antiques await you from one end to the other and all points in-between. The Gadsden to Chattanooga route is called the Lookout Mountain Parkway and will bear green signs that state this. Reader’s Digest named the Parkway as one of America’s most Scenic Drives.